It’s always fun to see a person who hates the world pontificate on the failings of humankind with a vituperative tongue. The Court Theatre’s production of Molière’s The Misanthrope gives us just such a character, all while providing a gorgeously produced, bitingly accurate commentary on the foolishness of societal conventions that’s just as applicable in the contemporary world as it was in 17th-century France. Not to mention what’s happening onstage visually—an outlandishly ostentatious combination of semi-French Baroque clothing, with cross-dressers, modern-day thigh-high boots, and garter belts. This first offering of the two-production Molière Festival gives us cattiness, love-lornness, gossip, and backstabbing worthy of any Gossip Girl episode today. Meet Alceste (Erik Hellman), a rich member of the nobility who hates flattery, gossip, and insincerity above all things. Unfortunately for him, he’s in love with the coquettish Célimène (Grace Gealey), who is hugely popular and hosts all sorts of men and women at her home—and engages in precisely the flattery, insincerity, and catty gossip that Alceste despises. Meanwhile, his poor heart is constantly played as Célimène entertains all sorts of other lovers, such as the would-be sonneteer Oronte (A.C. Smith), and avoids giving him a straight answer when he asks her to be devoted to him alone. Alceste has already gotten himself into trouble by refusing to praise Oronte’s attempts at a sonnet to Célimène, calling it all sorts of trash and generally tearing Oronte’s self-esteem to pieces. His foil, the socially sagacious Philinte (Kamal Bolden), urges him to be a little more diplomatic, but Alceste sticks firm to his principles. Hellman pulls off the character with admirable finesse, switching between self-righteous, pompous speeches to quavering tears at Célimène’s feet in seconds. Meanwhile, there’s a bevy of other men in love with Célimène, plus women fawning over the untouchable Alceste, as well as love triangles, court intrigue, and politics galore. The Misanthrope has an almost completely African-American cast, with the exception of Hellman and Gealey. This was a decision director Charles Newell and the other producers of the Molière Festival made in order to look at the play from what they feel is a deliberately new perspective; for the most part, these have been white-dominated parts in the past. Hellman, then, stands out particularly amongst his court. The theme of fresh perspectives is also followed with Célimène’s so-called friend, a supposedly prudish woman named Arsinoé, played by a man, Allen Gilmore. The acting in the entire production is completely on point, and Wilbur’s translation of the centuries-old Molière play is delivered in rhymes that sound neither stilted nor forced. Modern speech patterns make it all much easier to follow, helped along by plenty of jokes that keep the audience laughing. The costuming and staging are beautiful, too; with the Court Theatre’s traditional minimalism, the entire setting of the play centers around one set—a lavish bedroom, with all the characters in exaggeratedly opulent rich black robes and dresses with showers of gold ornamentation. The music, too, fits in perfectly with this production, which attempts to straddle both centuries past and the current era by mixing traditional court-style harpsichords and tunes with modern beats and electric remixes. This, in addition to the casting decisions and the modern translation by Richard Wilbur, propel The Misanthrope, written in the age of the Sun King and Versailles, into a setting that’s at once historical and contemporary, emphasizing the universality of the social critique launched by the play. It’s not just Molière’s age that was false and insincere; it’s an enduring trait of human nature to be dishonest. Yet despite the serious subject matter, the play is by no means heavy. Just look at Allen Gilmore, pulling back the hem of his dress to reveal his leg, clad in seductively feminine black hose, as (s)he tries to seduce Alceste, or Alceste’s immediate caving to Célimène’s anger, familiar to any henpecked husband, which makes the audience break out in giggles. No matter how dark Molière’s critique is, however, it’s the comedic aspects of his satire—rivalry between lovers, puffed-up courtiers, unrequited love, and the levels to which these courtiers stoop to snipe, insult, and ruin one another—that keep the audience entertained. 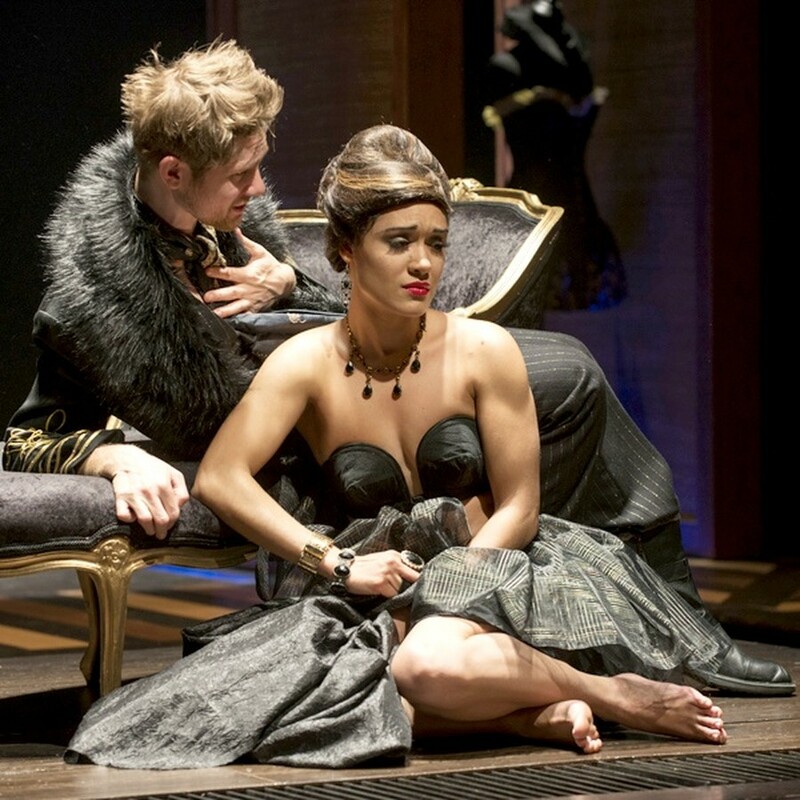 The Misanthrope will be at Court Theatre through June 9.